St. 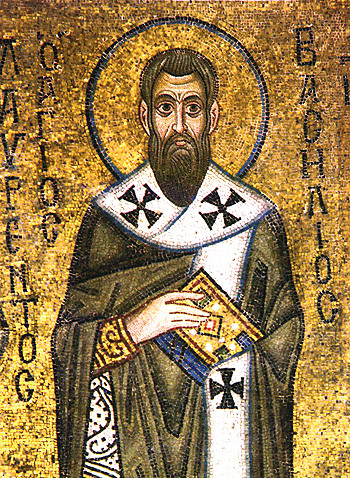 Basil of Caesarea, also known as St. Basil the Great, was a younger contemporary of Eusebius, and in the following generation of the Church of the late fourth century he emerged as one of the leading theorists of the Christian movement. His letters and instructions on the ascetic life, and his Canons (ethical judgements as from a ruling bishop to his flock) on morality and practical issues became highly influential in the wider church because of his role as one of the major monastic theorists of early Christianity. His canonical epistles were transmitted wherever monasticism went. Because monasticism was the substructure of the spread of the Christian movement, in the Eastern Church of antiquity his canonical views became the standard paradigm of Eastern Christianitys theoretical approach to the morality of war and violence, even though the writings were local and occasional in origin. Basils 92 Canonical Epistles were adapted by various Ecumenical Councils of the Church that followed his time. His writing is appealed to in Canon 1 of the 4th Ecumenical Council of Chalcedon (451), in Canon 1 of the 7th Ecumenical Council of Nicea (787), and is literally cited in Canon 2 of the 6th Ecumenical Council of Constantinople (681) which paraphrases much else from his canonical epistles. By such affirmations eventually the entire corpus of the Basilian Epistles entered the Pandects of Canon Law of the Byzantine Eastern Church, and they remain authoritative to this day. Our fathers did not consider killings committed in the course of wars to be classifiable as murders at all, on the score, it seems to me, of allowing a pardon to men fighting in defense of sobriety and piety. Perhaps, though, it might be advisable to refuse them communion for three years, on the ground that their hands are not clean. Although one is not supposed to kill, the killing of the enemy in time of war is both a lawful and praiseworthy thing. This is why we consider individuals who have distinguished themselves in war as being worthy of great honors, and indeed public monuments are set up to celebrate their achievements. It is evident, therefore, that at one particular time, and under one set of circumstances, an act is not permissible, but when time and circumstances are right, it is both allowed and condoned. This saying was being circulated, and given authority as a patristic witness simply because it had come from Athanasius. In fact the original letter had nothing whatsoever to do with war. The very example of the war-hero is a sardonic reference ad hominem since the letter was addressed to an aged leader of the Egyptian monks who described themselves as Asketes, that is those who labored and fought for the virtuous life. The military image is entirely incidental, and Athanasius in context merely uses it to illustrate his chief point in the letter -- which is to discuss the query Amun had sent on to him as Archbishop: did nocturnal emissions count as sins for desert celibates? Athanasius replies to the effect that with human sexuality, as with all sorts of other things, the context of the activity determines what is moral, not some absolute standard which is superimposed on moral discussion from the outset. Many ancients, Christian and pagan, regarded sexual activity as inherently defiling and here Athanasius decidedly takes leave of them. His argument, therefore, is falsely attributed when (as is often the case) read out of context as an apparent justification of killing in time of war. He is not actually condoning the practice at all, merely using the rhetorical example of current opinion to show Amun that contextual variability is very important in making moral judgements. In his turn, Basil wishes to make it abundantly clear for his Christian audience that such a reading, if applied to the Churchs tradition on war, is simplistic, and that it is just plain wrong-headedness to conclude that the issue ceases to be problematic if one is able to dig up a justificatory proof text from scripture or patristic tradition (as some seem to have been doing with these words of Athanasius). And so, Basil sets out a nuanced corrective exegesis of what the Churchs canon law should really be in terms of fighting in time of hostilities. One of the ways he does this is to attribute this aphorism of Athanasius to indeterminate fathers, who can then be legitimately corrected by taking a stricter view than they appeared to allow. He also carefully sets his own context: what he speaks about is the canonical regulation of war in which a Christian can engage and find canonical forgiveness for a canonically prohibited act; all other armed conflicts are implicitly excluded as not being appropriate to Christian morality. A Christian is not to become a soldier. A Christian must not become a soldier, unless he is compelled by a chief bearing the sword. He is not to burden himself with the sin of blood. But if he has shed blood, he is not to partake of the mysteries, unless he is purified by a punishment, tears, and wailing. He is not to come forward deceitfully but in the fear of God. The reasons Basil gives for suggesting that killing in time of hostilities could be distinguished from voluntary murder pure and simple (for which the canonical penalty was a lifelong ban from admission to the churches and from the sacraments) is set out as the defense of sobriety and piety. This is code language for the defense of Christian borders from the ravages of pagan marauders. The difficulty Basil had to deal with was not war on the large-scale, but local tribal insurgents who were mounting attacks on Roman border towns, with extensive rapinage. In such circumstances Basil has little patience for those who feel they cannot fight because of religious scruples. His sentiment is more that a passive non-involvement betrays the Christian family (especially its weaker members who cannot defend themselves but need others to help them) to the ravages of men without heart or conscience to restrain them. The implication of his argument, then, is that the only fighting that Christians ought ever to accept, in order to defend the honor and safety of the weak, will be inherently a limited response, mainly because the honor and tradition of the Christian faith in the hearts and minds of pious and sober warriors will restrict the bloodshed to a necessary minimum. His economic solution nevertheless makes it abundantly clear that the absolute standard of Christian morality turns away from war as an unmitigated evil. This is why we can note that the primary reason Basil gives that previous fathers had distinguished killing in time of war from the case of simple murder was on the score of allowing a pardon. There was no distinction made here in terms of the qualitative horror of the deed itself, rather in terms of the way in which the deed could be cleansed by the Churchs system of penance. Is it logical to expect a Christian of his diocese to engage in the defense of the homeland, while simultaneously penalizing him if he spills blood in the process? Well, one needs to contextualize the debarment from the sacrament in the generic 4th century practice of the reception of the Eucharist, which did not expect regular communion to begin with (ritual preparation was extensive and involved fasting and almsgiving and prayer), and where a majority of adult Christians in a given church would not yet have been initiated by means of baptism, and were thus not bound to keep all the canons of the Church. By his regulation and by the ritual exclusion of the illumined warrior from the sacrament (the returning victor presumably would have received many other public honors and the gratitude of the local folk ), Basil is making sure at least one public sign is given to the entire community that the Gospel standard has no place for war, violence and organized death. He is trying to sustain an eschatological balance: that war is not part of the Kingdom of God (signified in the Eucharistic ritual as arriving in the present) but is part of the bloody and greed-driven reality of world affairs which is the Kingdom-Not-Arrived. By moving in and out of Eucharistic reception Basils faithful Christian (returning from his duty with blood on his hands) is now in the modality of expressing his dedication to the values of peace and innocence, by means of the lamentation and repentance for life that has been taken, albeit the blood of the violent. Basils arrangement that the returning warrior may stand in the Church (rather than in the narthex, where the other public sinners were allocated spaces) but refrain from communion makes the statement that a truly honorable termination of war, for a Christian, has to be an honorable repentance. Several commentators (not least many of the later western Church fathers) have regarded this as fudge, but it seems to me to express, in a finely tuned economic way, the tension in the basic Christian message that there is an unresolvable shortfall between the ideal and the real in an apocalyptically charged religion. What this Basilian canon does most effectively is to set a No Entry sign to any potential theory of Just War within Christian theology, and should set up a decided refusal of post-war church-sponsored self-congratulations for victory. All violence, local, individual, or nationally-sanctioned, is here stated to be an expression of hubris that is inconsistent with the values of the Kingdom of God, and while in many circumstances that violence may be necessary or unavoidable (Basil states the only legitimate reasons as the defense of the weak and innocent), it is never justifiable. Even for the best motives in the world, the shedding of blood remains a defilement, such that the true Christian, afterwards, would wish to undergo the cathartic experience of temporary return to the lifestyle of penance, that is be penitent. Basils restriction of the time of penance to three years, seemingly harsh to us moderns, was actually a commonly recognized sign of merciful leniency in the ancient rule book of the early Church. Fr. John McGuckin is professor of Byzantine History at Columbia University and professor of Church History at Union Theological Seminary. He was ordained for the Patriarchate of Romania but is currently assisting at St. Mary Magdalen Orthodox Church (OCA) in Manhattan. Among his recent books are St. Gregory of Nazianzus: An Intellectual Biography , Standing in Gods Holy Fire: The Spiritual Tradition of Byzantium , and The Westminster Handbook to Patristic Theology . This is an extract from a longer essay, Nonviolence and Peace Traditions in Early & Eastern Christianity, included in the newly published book, Religion, Terror, Globalism, Non-Violence: A New Approach (Nova Publishers) edited by Fr. K. Kyriakose. This full text of Fr. Johns essay, including end notes, is also posted in the Resources section on the OPF web site.